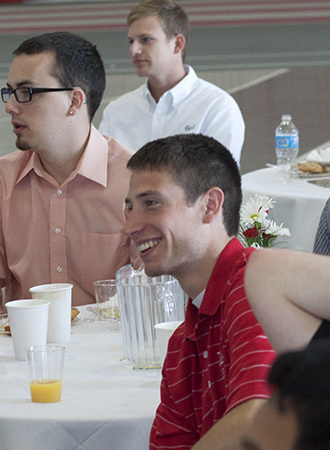 Three Wabash College seniors were honored Saturday morning at the traditional Deans’ Senior Breakfast. Andy Walsh earned the Frank Hugh Sparks Award for All-Around Student Achievement and Adam Barnes and Ryan Cloyd shared the John Maurice Butler Prize for Scholarship and Character. Named in honor of the College’s eighth president, the Frank Hugh Sparks Award for All-Around Student Achievement is given to a senior who has done the most to promote the true spirit and purpose of Wabash College. A native of Clinton, Ind., Walsh was a Dean’s List student in all eight semesters and was inducted into Phi Beta Kappa. The psychology major served as president of Psi Chi, the psychology honor society, WAR Council, and AMPED, in addition to memberships in Sons of Wabash and Senior Council. He earned five varsity letters as a student-athlete, including three in basketball and one each in football and track and field. Given annually since 1923, the John Maurice Butler Prize for Scholarship and Character is voted on by the entire Wabash faculty and is given to a student of high character and great ability. A native of Bradford, Pa., Barnes was awarded a Fulbright Teaching Assistant Scholarship and will be based in Madrid, Spain, educating high school students. A double major in biology and Spanish with distinction in both, he plans to attend medical school following completion of his Fulbright. Barnes is a Lilly Scholar, was inducted into Phi Beta Kappa, earned the Earnest G. Carscallen Prize in Biology, and was a George Lewes Mackintosh Fellow. A four-year member of the Wabash swim team, Barnes served as captain in each of the last three seasons. A native of Beech Grove, Ind., Cloyd majored in biochemistry and minored in psychology, classics, and biology. A Dean’s List student, he received the Dr. Paul T. Hurt Award for All-Around Freshman Achievement and was a finalist in the Baldwin Oratorical Contest as a sophomore. Cloyd received the Underwood Chemistry Award and was inducted into Phi Beta Kappa in his junior year, while also serving as a Junior Marshal during Commencement. He is a member of Kappa Sigma and will be working in Luxembourg following graduation. The Sparks Award and Butler Prizes are the top student honors for a Wabash graduate. Phillips offered a challenge in his final address to the Class of 2014: to think about questions and why the liberal arts, and Wabash, offer a home for living with questions. Wabash celebrates its 176th Commencement Exercises on Sunday at 2:30 p.m. on the College Mall. The ceremony will be streamed live at www.wabash.edu/live.